Every January, when Sundance buzz hits its peak, film buff restrained to their local cinemas sift through all the reviews just to salivate over what might make it to our hometown. This year there was a rumor, the faintest hint, that a film like Bellflower existed: a film full of emotion and power, a film filled with muscle cars and flamethrowers, a love story at the end of the world. Bellflower, by most accounts, seemed to be hardly contained by the very screen it was projected on. Having now seen it, all I can say is that everything I had heard fell far, far short of the actual film. 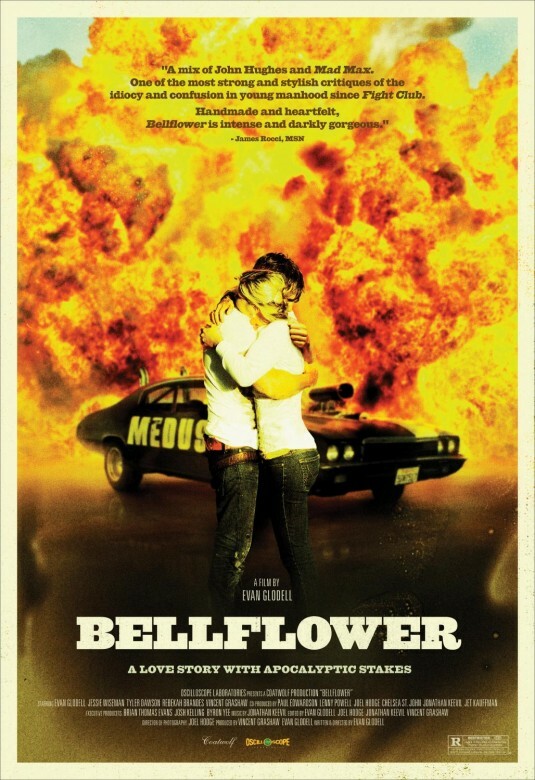 Bellflower is told in a mostly linear style; flashbacks and forwards occur frequently but are only really disorienting toward the end of the film. At the center of this tale are two best friends, Woodrow and Aidan, who take inspiration from their favorite childhood film Mad Max and begin constructing weapons and cars to put them on top in the case of the apocalypse. Their “gang,” the Medusa Mothers, is an exclusive boys-only type club, in which they shoot propane tanks with sawed off shotguns, trick their cars out to belch flame, and do anything else that can cause some (seemingly) nihilistic destruction. Enter Milly, who shows up at a bar during a cricket-eating contest. Her main competition is Woodrow, and their encounter leads to eventual flirting, phone numbers exchanged, and a bright future for each. After a cross-country date (she asks to be taken to the most disgusting place he can think of, he takes her to Texas), they return home, sort of a couple, sort of living together, sort of in love. Meanwhile, Aidan and Woodrow have restored a motorcycle, and finished building their flamethrower. Woodrow has always been something of a self-conscious, unsure gentleman, and that doesn’t stop with his newfound relationship. When he begins to worry, doubt, suspect that something untoward might be going on, he sets up a plan to catch Milly in the act, which he actually does. Milly has been sleeping with her roommate, an awful guy named Mike. In his confusion and rage, Woodrow gets on his motorcycle, kicks his helmet into the street, and gets hit by a car, ending up in the hospital. I will give away no more than that, because what happens in the final 45 minutes or so is truly jaw-dropping. The visuals are explosive, mirroring the internal volatility of Woodrow, for whom the world has finally ended, making their weapons and preparation all the more necessary. The cinematography is profound, vicious, and on fire. The way director, star, and writer Evan Glodell managed to accomplish such a unique visual spectrum is by building his own camera. The effect is an apocalypse of one, showcasing Woodrow standing at the center of his own personal Roland Emmerich film. The promotion for the movie is a bit deceptive. The ads focus more on the cars and flamethrowers (which do compose an enormous amount of the film’s character), but the film is more about the end of a relationship, the accompanying suffering that comes with that end, the loss of identity and the unbearable lightness of being alone. Shot on cameras with frayed wires and dusty batteries, the film is rough around the edges, and full of imperfections. Those imperfections are the very things that make it real – there is no sheen of Hollywoodization, no patina that glosses over the nature of things. Sometimes life is equally rough. Sometimes you feel like destroying something beautiful. Sometimes, particularly after a rough break-up, you want to kill someone, punch a hole in a wall, and/or break something in half. This film is about that pain and you’ll be hard pressed not to feel it. Bellflower is now available on DVD. This entry was posted in Reviews and tagged Bellflower, Evan Glodell, Medusa, Sundance. Bookmark the permalink.